Classic I Heart Badges. 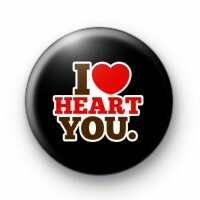 This bold black 1-inch badge has the romantic message I Love Heart You written is a stencil style font. You can tell your significant other you love them any day of the year but it is extra special if you say it with a handmade badge! Our romantic badges are lovely to give as tokens of your love or use as keepsakes from parties, events such as Weddings or Valentine's Day. They arrived yesterday. Thanks - they are great and very efficient service!